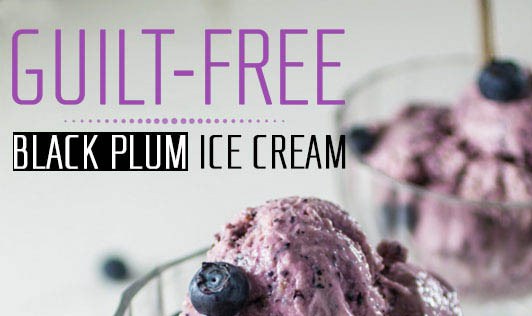 Guilt-free black plum (jamun) ice cream is made with reduced low-fat milk, corn flour, and a sugar substitute. This surprisingly creamy ice cream will give you all the benefits of Jamuns minus the calories! Mix the corn flour into a ½ cup of cold milk and set aside. Boil the remaining milk in a nonstick pan and add the corn flour paste. Bring the custard to a boil, while stirring continuously on a low flame until the mixture begins to coat the back of your spoon. Cool the custard completely and add the sugar substitute and black plums (jamuns). Pour into an airtight container and freeze for 4 to 6 hours. Once the ice cream freezes, blend it in a mixer until the mixture is slushy. Pour it back into the container and freeze again until the ice cream is set. Taste the ice cream mixture after adding each sachet of sugar substitute to determine how sweet you want it to be.